Today has been OK. I went to have a blood test and then continued on my way to donate blood. That was an ordeal, taking over two hours and left me with numb-ish lips and a very sore arm. I hate doing it so much but these people have a way of pestering me into doing it more. I much prefer straight whole blood donations (and the additional benefit of having my body replenish the blood). I saw lots of crazies wandering around, and I'm sure more will be coming out tonight! The lines in front of Ricky's costume shops are ridiculous! Maybe the costumes go on sale today so that's why everyone waits until the last minute? I doubt it though! 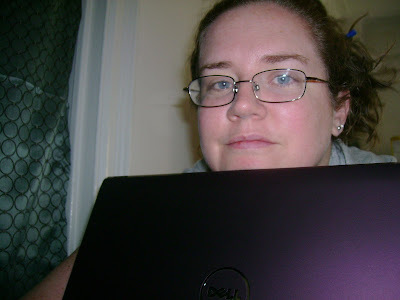 Here's a picture of me with my new toy, a Dell Laptop on which I'm writing this, my first blog post. Yes, it's purple. I don't know why that color makes me SO happy, but it does. And apparently it's got to the point where I see other colors when I look at purple (i.e. a work related thing I thought was blue is actually purple). Could it be time for purple rehab? Hopefully it's not that serious. And I'm pretty sure my love affair with the color won't end. I've had an affinity for the hue since high school for sure, when my Gran made me my gorgeous purple afghan. There could be worse things. I'm anxious for Shawn to get home so he can set up the wifi connection and get everything in secure mode before I really use this computer a lot. Windows 7 so far seems OK. Kind of similar to a Mac with the floating toolbar thing at the top, but I'm digging it. Because I mostly play with it offline I've been really enjoying Majong again. HA. I am terrible at it though. The back lit keyboard was a free feature that I think I'll really like, although I assume it will eat battery life, so maybe there's a way to turn it off. 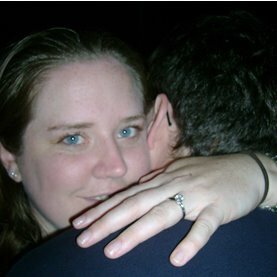 Shawn will be home tomorrow, and yesterday was the fifth anniversary of our meeting -- at a Halloween party in DC. PS I'm starting NaBloPoMo tomorrow, so you have at least one/post per day from me in November to look forward to. I did it last year, and hopefully this new computer will make that goal even easier to attain. Here's one of several photos of the Tiramisu blanket I made this month. Holly sent me the pattern. I made it to use up the green yarn I had left over from my last baby blanket, but I still have more. Not sure what I'll do with it, but it's certainly a great color. The pattern is super easy -- basically single crochet. But because it's single crochet, it takes a long time. I also didn't do a great job keeping the sides straight, as evidenced by at least one of the photos. But the ribbon ties at the corner are just too sweet. Probably impractical for an active baby and the ribbon might even be a choking hazard. But the blanket looks cute even with the ribbons removed. The plan is to donate this to the church craft fair along with some thread snowflakes and stars, which still need to be starched. I made this face earlier this week and Shawn just wanted to capture it. 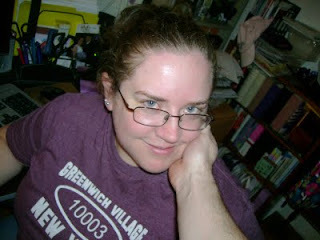 Note the pink face from exercising and the utterly ridiculous T-shirt, which is super soft and I love so much! This day ... this day. It started with a one heck of a racket in the hallway -- the sound of hammering on metal. This continued for FOUR hours straight, and I finally realized it was the Verizon people installing Fios in our building by first pulling down all the material holding up the cables or wiring or something. I was nervous about losing Internet connection -- they had wires everywhere -- but everything stayed online aside from the usual Outlook connection issues. Shawn got on his way to Lubbock. I won't hear that he arrived for a while yet, I think. But we'll see. He's there for a conference and networking. It's what it takes to make the bank I guess. Time investment in the career and our future. So I can deal. Definitely missing him though! At about 1:30 or so I decide to run out to the NYU ticket office and buy seats for the "Wishful Drinking" one-woman show by Carrie Fisher. Shawn normally buys things because he has the full privileges ID, but these didn't go on sale until after he left. It's raining pretty steadily, but the building is just a couple blocks away, so I figure why not? I actually had no hassles getting the tickets. The guy wasn't allowed to sell them to me on Shawn's ID, but when I showed him mine he said "don't worry about it" and sold them. I put them snugly in my left hip pocket to protect them from the rain. Up Greene Street, to Waverly, over to University, up to 9th Street, across 5th Avenue, almost to 6th Avenue ... when I spot them! They're just lying there, so sad, on the sidewalk, totally drenched and just uck. I pick them up, turn about and head back home ... where there's time sensitive work to do on top of everything else. The tickets are drying out and the ink didn't run or anything. The envelope was ruined, but I'm glad they were in an envelope to have at least a bit of protection. "Wishful Drinking" had better be a wonderful show after the panic and racing around to find them! It's been a long time since I read Wicked, so I was a bit confused and the book never really caught me up, so I'd recommend reading these in quick succession. The book raised a lot of questions, more than it answered for me (but that might be due to my confusion over Wicked). I might read the next book (about the Lion), but looking at its Wikipedia page it doesn't seem to answer the questions (like what exactly happened to Nor).I still think the series is incredibly clever, taking a beloved story and flipping it around ... while still keeping the original storyline in tact (although positioning it as a sugar-coated version of events). A blog in my RSS reader mentioned these books as a starting point to think about for writing good blog posts or other content. Can you look at something that's stumped you from another perspective? I'm still looking. It's been so long since I've read a Grisham novel, but I knew I liked them. This was a fast read, pretty compelling storyline and the legal speak made accessible, which makes me feel smarter. It was different from what I remember in his other books in that the little guy doesn't win. But oddly I found myself somewhat rooting for the "bad" guy ... maybe because of his NYC lifestyle or maybe because I just knew if he'd gone down in flames it would have been wholly unrealistic. The end was a little contrived though, with several things happening to a justice and his family that made you think he *might* come around to the "right" decision on the appeal. I'm going to track down some of his other books too, because if nothing else it's great subway reading. For the first time Shawn beat me at Horse today. He was drilling shots left and right. We had a great time. Now my back is killing. Hope it's better by the morning. Shawn killed a HUGE mosquito today on the wall. It was FULL of my blood, judging by the mark it left and by the various bug bites on my body. Especially troubling are those on my elbow. Hope its friends go away and die soon, and that it wasn't infected with West Nile. There was a flier in the basement saying "be careful" of the virus and it's been spotted in the West Village ... hard to do that when the windows in the building have no screens. A screen wouldn't work because the windows open out and you need access to be able to open them. I wonder if a weighted drape of screen-like material would do the trick. Going to the gym every day is not a welcome ritual, but it is a ritual none-the-less. Today we got to see the men's basketball team working out. There are about 18 of them, and they're pretty good, at least against each other. They're all white. I have probably mentioned that before when we were watching them last year (only in double headers with the women's team). Work is the same, which means there's plenty to report if I were to get into the habit of recording my reactions and thoughts about that. But we ALL know that's not in anyone's best interest, so for the time being Shawn is the sounding board and so it goes. I'll survive. Lots of potentially fun things coming up. Shawn has a conference next week in Lubbock. I should have invited someone to come visit me over Halloween. The parade of crazies should be pretty fun -- especially since it's a Saturday night. Shawn's cousin's birthday is in November (a couple weeks older than me), so we've been invited to her soiree (had to spell check that one). Shawn has another trip in mid-November and then we're off to Danville for Thanksgiving. One week after we're back we'll be on our way to Miami for a week. I'm actually taking a week off from work! I haven't really done that since the wedding (and even then I'm not sure if I took a full week off because Memorial Day was involved). Shawn has a conference there and I'm tagging along. Then just a couple weeks after that and we'll be on our way to Oklahoma for Christmas. We also checked out the NYU ticket website, and there are cheap Knicks tickets and a couple plays we'd like to go see, so we can certainly have a few date nights in the midst of the travel and excitement. My crochet is trudging along. I've done about 12 snowflakes and stars for the upcoming church craft fair. I'm going to keep making them because I can't starch them (make them stiff so they can hang from Christmas trees) until it's a clear day (strict instructions from Gran on how to do that). 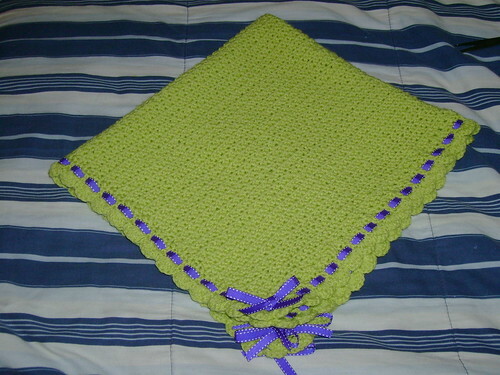 I am almost finished with the green Tiramisu blanket, which I also plan to donate to the fair. It's a really pretty spring green and I'm left with excess yarn, so I'm trying to come up with a project for that. I think I might do a quick scarf, either as a gift or an additional donation. The fair is coming up quickly though, so I don't know if I'll have enough time to get another project done. I also need to revisit my "wedding" bedspread. I think I've done five of the ~24 or so squares I need to make. Each one takes HOURS, and I haven't done one in probably a year. I'm also pretty sure that the one's I've done don't match each other exactly, so I'm not sure how hard it will be to piece them together. Crochet is flexible, but thread crochet is less so. The bedspread is something I definitely want to see finished. I guess the additional year in NYC gives me that much more time to shoot for having it done before we move into a real house. I won't beat myself up if it doesn't happen though. I'm always better at meeting my deadlines creating things for other people than creating things for myself. The rain's really coming down today. Very soothing. Maybe I should get more flexible. Oiy. Nothing unusual with work today. I went to the post office after work and then to Duane Reade for envelopes, the deli for Think Thin bars (until my Amazon delivery arrives later this week) and the gym. I pushed a bit, which makes me feel better. I should do that more, and get back into weight training. I loved having strong muscles. One step at a time -- need to get consistent with gym-going first! Church was solid yesterday. We've had gloomy chilly weather, but inside the sanctuary it was warm and bright. The children's sermon was pretty great. She asked them all "what do you like to do for fun?" The kids said -- soccer, basketball, jump rope, watch TV, swimming, etc. Then she asked "who likes to draw?" and everyone raised their hand. We're doing what we love -- God made us the way we are and to enjoy doing things, and having fun is a blessing from God. And we need to share that joy with others -- whether playing with your basketball or soccer team or drawing a card for someone. I thought it was a pretty straightforward, solid message for the kids. And I needed to hear it too. My joys are crochet and writing letters. Both are things I can do with others and/or for others. Crochet projects are moving along but nothing complete yet. Need to get in gear. Baseball is killing me -- I just want to see House. I forced myself to the gym tonight, even though I worked until almost 7 p.m. (straight through from 9 a.m. ... I'm clearly doing something wrong) and scarfed a bite of dinner and just wanted to watch TV. I didn't work out very hard or anything, and I forgot my music. I was forced to listen to the fan and the whir of the machines - people running on the treadmills making a rhythmic soothing sound. I read my magazine, so it wasn't the worst. I should focus more on pushing myself. At this point I'm just proud of me for getting out of the apartment regularly. Huh. The reason for this post is that on the way to the gym I overheard a conversation that kind of made it worth while. It was a couple of guys, one of whom worked at Ricky's Halloween store (or somewhere else where he'd have to wear a costume at work). He was talking about some list of 25 year olds who had changed the world and was freaking out about how he'll be 25 in SIXTY DAYS! OMG he needs to change the world fast. Also that when you're old and excellent no one cares because you're supposed to be that way. We were almost at the gym (they kept walking), but I really wanted to say most people are not going to change the world in a huge way. But most of us can change OUR worlds -- be a positive impact on the people around us. Just the same we can also have negative impacts that change our worlds just as much. I also wanted to knock their heads together. I did nothing -- just walked along to the gym, swiped in and did my elliptical thing. A fact about me that I tell practically everyone I meet is that I graduated with a high school class of 15 people. I found out yesterday that one of those 15 has done something unspeakable, shaking my little hometown and the surrounding area. I don't understand and probably never will. This book is a how-to/handbook for getting traction online. I'm not sure I want to be so popular, but I guess the thinking behind why I should read this book is to get ideas for how to make my employer popular online.Of course the "real" reason I bought (!) and read the book is because I like Chris Brogan, his blog and his attitude, which is the point of the book (be nice and people will like you and spread your message). Page 190 "Words comprise only 7% of what is being communicated. Thus, those who don't know how to handle the omission of 93% of all human signals (38% vocal tones and 55% body movement) either stay away or make dreadful mistakes. "The book reinforced a lot of what I already knew and believed, and there was a lot of "duh, big red truck" advice, although that was also the point.I was surprised by the lack of sources in the book - no citations or footnotes to speak of, although they definitely did research. They also never defined "content marketing blog" ... which is a little jargony. I get what they mean, but kind of broke their own rules about clarity. This was a request from the library - my first in ages. Someone recommended it/reminded me of it online. This was a SUPER fast read (try just over an hour) because of wide spacing and large fonts. It reads like a gossip magazine in some respects but also really funny and snarky ... mostly about herself (and her dad Eddie Fisher). The book is smart and fun, and I can't believe I've never read any of her novels. Something else to request at the library!!! I share links through my Google Reader, and if Google worked as I think it should I would be able to share those in round-up posts created automagically by Blogger. WordPress has a plug-in for that, but until I block off the time and really learn WordPress and transfer this blog to that platform I'll continue to selectively share via posts, and I have two to share today, neither of which I actually shared w/ "note in reader." I don't think I do that too much on my blog, but I know on Twitter I am insanely gripe-y and I shouldn't be. I like "without having to own it in person" -- that I shouldn't write anything about someone that I wouldn't say to them directly (even if I vaguely refer to someone). A good goal to strive for, made especially hard given the fact that I don't speak TO people most days and am limited to e-mail. But I digress. Advice Columnist Stands on Her Faith: This is a UMC feature about "Ask Amy" -- a lifelong Methodist. I remember reading an excerpt from her book in a women's magazine, probably around last Christmas. I had wanted to read her book, and should still add it to my "to read" list ... and here's an idea, actually request is from the library! Today's Upper Room reading was outstanding, based on the scripture Colossians 3:23, "Whatever you do, work at it with all your heart, as though you were working for the Lord and not for people." I like the idea that no matter what we are doing we can do it in ministry for the Lord. Putting that into practice is another matter entirely, but it definitely lifted me today, and I hope it does the same for you. went outside and almost got knocked over it was so windy. reminded me of oklahoma (wind sweeping down the plains and such). 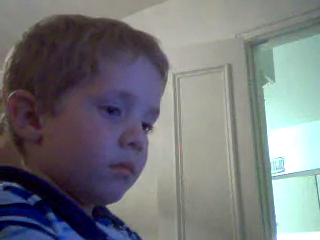 webcammed with my mother-in-law for the first time and with Owen - he actually interacted and sang me the funniest song. it was greek night at the gym ... or something. they were having crazy competitions, including tug of war. those were pretty hilarious. How innocent and sweet I look! After the darkness of yesterday -- really just a terrible day punctuated in bouts of self doubt -- today has been a welcome bit of light, remembering why I am here, in this city. To be with my beloved. All the other stuff is ... just that, stuff. Also it didn't hurt that I got a card from my best 5-year-old with birthday photos and TWO custom drawings -- Optimus Prime and Thomas -- to add to my collection and display. In an attempt to keep the positivity on an upswing I'm forcing myself to go to the gym. So I'd better get moving. Aside: the building handy man came to our door today ... Shawn had failed to tell me he'd reported our weird sink - it was wobbly and had a bit of a leak. The handy man was working away, swearing under his breath at it while I worked at my computer at some PowerPoint stuff, feeling equally frustrated at times with the program and my computer's processor. SO for about 45 minutes today I had a co-worker ... at least we were working alongside each other at our respective tasks. HA! My mom (or main reader of this humble blog) just told me she doesn't like negativity online. But this has been such a terrible day I can't help myself but chronicling it. I'll try to add some positives to balance it. MTA hates me. Transit never fails to screw me up somehow. Last weekend it was the 4/5 running local, and me getting off a 6 train to church to wait for the express that never came, meaning I was late for church. I knew better this time, so Shawn and I got to church on time no problem. The service itself was disjointed and long - over an hour and a half. There's a rotating cast of guest organists and this one played extra/delayed the start of the service, and the pastor got confused a couple times about the order of worship, causing some doubling back. Really pretty strange. Positive - I think someone's prayers are being answered, as the pastor's sermons are getting better to me ... they're not as good as the pastor previously before her, but they're definitely delivering messages I need to hear. So that's something. The trip back from church ... not so easy. We decided to save $ and take the bus home. We walked to 5th Avenue to take the direct bus, and get on. Of COURSE at 59th street the driver informs us no buses can go "up" 5th Avenue due to a parade. First of all, it's DOWN 5th Avenue. The only way you can go up it is to go against traffic, but I digress. We could have stayed on the bus and gone over to 7th Avenue, but then we would have been on the opposite side of 5th Ave. from our apartment, meaning we could find ourselves in the same situation we did during the gay pride parade. No thanks. So we got off at 59th street and got on the subway there, no problem. But of course it's another $4.50 we wouldn't have paid had the bus just run normally. I guess the moral is to check MTA before EVERY SINGLE TRIP you make - no matter how often you make it. A positive - the German family that was on the 6 with us to church was ALSO on our bus when we got out of church (they went to a museum - either the Guggenheim or the Met, we couldn't really tell). I thought that was a funny little coincidence. Another positive - we went to the gym again today. I'm not feeling 100% but definitely well enough to shoot around. We did the same yesterday, just goofing off but also getting sweaty and working on our shots. Good times. It leaves me exhausted, but that's a good thing. After watching the DVR'ed SNL from last night (meh, but better than last week's), I decided to turn on my laptop ... the dreaded black screen again. Not sure what's going on, but I'm making the executive decision that I need to toss this one and move on/buy myself a new, lighter purple laptop. (Purple is optional but desirable). So, fire up the desktop and log on to my AOL mail. I've got about 50 messages from Facebook... Including several from "myself" ... meaning someone hacked my account and started posting advertising messages. Frantic, I change the password and go through a few other accounts (MySpace, Twitter) that have similar passwords to change them too. I hope I'm not forgetting any. But just really gets my blood pressure up and cranks me right out. UGH. And it started posting things on people's accounts that I haven't thought of in a long time. If someone did that to me I would probably de-friend them. So it's possible my already meager friend count will drop. I guess I'm OK with that. I think if I had my druthers I wouldn't really log onto FB all that much anyway. Now I'm writing this and feel so ... yucky. Just ... I don't know. And add to the fact that work creeps into my mind constantly ... just things to do/things I wish I didn't have to do kind of stuff ... and the stress/excitement of our future makes me even crazier. A final positive, although from yesterday, we went and saw "Whip It" ... Drew Barrymoore's directorial debut. VERY good. I love Kristen Wiig, like want-to-write-her-fan-letters love her, and the past two movies we've seen have her in them. (She's also a big reason why I watch SNL ... just kidding/just kidding/just kidding/just kidding.) Anyway, I loved Whip It, except for the blatant commercial I thought was subversively added - "You can never have too much eyeliner ... or Lash Blast" was a line in the movie. Lash Blast is Cover Girl's brand name for mascara and is shilled by Drew Barrymoore. I don't doubt that she got paid for that placement, but I still though it was weird. I wonder if there were others like that I missed. Oh, and it also REALLY made me want to move to Austin. Fingers and toes crossed that dreams can come true, but we'll see. I bet it also planted the idea of my friend Holly in my head (Holly of Austin fame), as I dreamed about her last night. Hrm. This is just a brain dump of anxiety. Pray for me, my sanity and my husband!